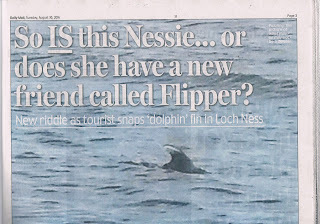 No sooner has the discussion about the strange dorsal fin at Loch Ness photo began to subside than another one appears in the Daily Mirror today. This photo appears to show two large objects, each estimated at 10 metres long, making their way along the loch and was taken the day before our aforementioned fin photo and was in the same area of the loch, opposite Inverfarigaig, where Kate Powell photographed that mysterious dorsal fin. My first reaction was to check for anything indicative of a dorsal fin, but since the picture was taken at a distance of 400 metres, it is too far to make out such detail. Something barely breaks the surface on the two objects, but who knows what they are indicative of. The article mentions the possibility of two flippers visible in the picture propelling the object, and one can see two water disturbances either side of the object to the right. However, I cannot ascertain if that is the words of the witness, Ian Campbell, or the editor's words. Whether this has anything to do with the recent dorsal fin picture is hard to say. But two dolphins? This loch is beginning to get a bit too crowded, so I'll suspend judgement on this picture, let the usual waves, logs and birds explanations have their say and move on. It's the creature that's terrorised the water's of one of the UK's deepest lakes for decades - but now it turns out Loch Ness could actually be hiding TWO monsters. A new photograph snapped at the Scottish loch has revealed what looks like a duo of swimming animals in its depths side by side. Ian Campbell was on a bicycle ride with his son and a family friend when he spotted two big 'creatures' apparently swimming across the Loch together. The 56-year-old, who says he is not a man 'given to flights of fancy' is convinced that what he saw and pictured from around 400 metres away were both around ten metres in length. 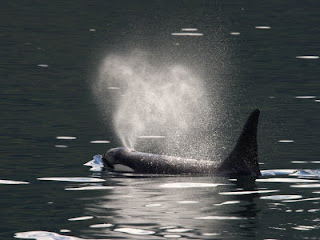 In one of the pictures it appears that whatever was in the water was propelling itself along using its two flippers, one at each side of its body. If what Mr Campbell pictured was a type of hitherto undiscovered creature, then it could mean that the Loch Ness monster has been breeding - or, on the day he saw it, swimming around with an offspring or mate. Mr Campbell was around five miles south of the village of Drumnadrochit on the western shores of Loch Ness while on a 40-mile bicycle ride between Fort Augustus and Inverness on hill tracks on August 21 with his son Fraser, 13, and family friend Mrs Karen MacPhee, 54, when the two shapes appeared in the water. Mr Campbell's son also saw the 'creatures' but Mrs MacPhee was cycling some way behind and did not get a good look. Mr Campbell says they watched for around 30 seconds before losing sight of the objects but he managed to take a photograph using the camera on his phone. He says: "At the time we saw it we had stopped for a rest and to admire the view. It seemed to appear suddenly from nowhere. "I said to my son: 'What is that in the water?' He said to me that it looked like a big animal. "I said 'I think you're right' and grabbed my camera phone to take a picture. "We watched for around 30 seconds before it disappeared from view and by that time Karen had caught up and she saw it for around five seconds. "We talked about it afterwards obviously and we just had no idea what it could be. I would estimate they were ten metres in length and I took the picture from around 400 metres away. "I was saying to my son that we had just seen the Loch Ness monster and he was saying 'Yes, right'." Mr Campbell, of Taynuilt, Argyll, who works as an environmental health regulatory officer for Argyll and Bute Council, said he knew the area well. It was a calm day and he had never seen anything like that before. "I am convinced that what I saw was two creatures,' he said. It is now over two weeks since a photo of a mysterious fin like object was taken at Loch Ness. The picture was published in the Daily Mail the following week, and one week on from that there has been debate but no unanimous conclusion as to what is in the picture. The opinions vary from a live dolphin swimming in Loch Ness, a hoax fabricated by digital manipulation software (usually referred to as "photoshopping"), a gull flying low over the water, debris, a predator bird struggling to rise from the water with its prey and, finally, some attempts to see a long neck of the Loch Ness Monster from a view of forced perspective. Now, it is often opined that we do not get clear enough images from Loch Ness. Well, we have one now, but still people can't agree as to what they are looking at! My own definition of a "clear image" is one that you don't need an "expert" to tell you what you are looking at and I think that applies here. My guidance on this is simple - if this picture was taken in the nearby coastal areas where we know dolphins and porpoises swim, I suspect there would be near unanimity that it showed a dorsal fin. However, it was taken at Loch Ness and so a different mindset kicks in and some near Orwellian attempts to tell you what you are "really" looking at have ensued. So, to restate my own opinion, it's a dorsal fin. The only argument is whether it is a real dorsal fin or a fake dorsal fin. A fake one could be someone swimming with a model fin on their back, but that is a theory I don't think anyone is taking seriously. The other is a digitally manipulated image. Having been granted access to the original image, I ran it through some tests in order to find any signs of manipulation as well as consulting a photographic expert (with thanks). For those of you interested in that sort of thing , the device was a Samsung Galaxy S5 smartphone with a 16mp camera, using the equivalent of a 31mm focal length and shutter speed of 1/1100 of a second (therefore motion blur unlikely). Some experiments taking shots outside suggested a one foot high object would be 160 metres from the observer. I ran the original image through a suite of analysis functions available at fotoforensics.com. The first was an ELA or Error Level Analysis. This works on the principle that a JPEG image should uniformly and roughly have the same level of data compression (JPEG is a process which compresses the original image to a smaller file size but usually with the loss of information). Any differences in compression rate in an image is suggestive of digital modification. What I was looking for was the object's ELA to stand out more from the rest of the surrounding image. The result was pretty inconclusive, mainly because the object occupies a very small portion of the image. In fact, it only occupies 0.01% of the image which I do not think lends itself to accurate metrics (screen grabs shown below). However, as a comparison, I ran a photograph of the derelict pier at Dores Bay through the ELA as well. I picked this because the dark, distant posts in the picture offer similar dimensions and tones. The result was pretty much similar to the fin picture, so I conclude there is nothing suspicious from the ELA point of view. The top picture below is the relevant portion of the original photo. The second analysis tool is JPEG Quality. Each time an image file is opened in a graphics editor and resaved, there is a potential loss of image quality (this depends on the quality level selected). The loss of quality can be estimated and compared to other images. The JPEG quality came out as 96% which is pretty high and suggestive of a lack of image editing. The comparison photo from Dores came out at a lower percentage. Each digital picture is accompanied by a metafile called the Exif file which contains information about the picture. On examining this, the date and time was set to 14:04:10 on the 22nd August 2016, which is consistent with the report. Steve Feltham said he examined the image the day after and he confirmed that the Daily Mail's "lady in the tea room" who saw it on the day it was taken was the Waterfall Cafe at Foyers. These facts are consistent with the image not being tampered with. 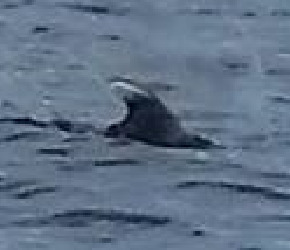 The other point regarding digital manipulation is that some have observed an area around the fin which it is claimed points to the image being added to the picture. You can see this above the fin in the zoomed in picture below. What I would say is that this blurriness occurs elsewhere on the picture and may be there in combination with possible spray from the blowhole of the dolphin as the pictures below show. By the time the blowhole has submerged in the picture, the water droplets are dropping around the dorsal fin. Another possibility (perhaps in combination with the first) is that the smudging is a result of the approximation of the data or noise reduction. Of course, the analysis could be more thorough and we could be up against a master photoshopper, but I doubt that. A quick word on the idea that we are looking at the back of an osprey here. These birds of prey have dark backs and a whiter head. This loose connection with the white tip on this dark fin as a whole has been overegged to present us with the opinion that it is such a bird trying to drag a fish out of water. I compare two images here. Now one could spend ages finding the best fitting image for these, but they are not the same creature to me. 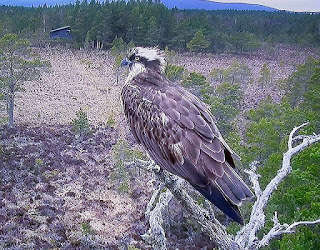 There are no detail of feathers or colour changes on the Loch Ness image; indeed the object in the loch looks too dark to be an osprey. The only reason for this osprey interpretation appears to be that part of the osprey's head is white. If one claims that the light levels were too low, the uncropped picture shows a sunny day with blue skies and some cloud while an analysis of where the sun was on that day gives us the yellow line on the chart below indicating that the observer was between the object and the sun suggesting that there was plenty of sunlight to illuminate detail such as plumage and tones. We see none and the colours are more consistent with that of a dolphin's drab dorsal fin. Would need convincing this isn’t photoshopped – and even then am not convinced it’s even a bottlenose dolphin – certainly not one we know. That email made me wonder what I was looking at if even a local expert was not convinced it was a local dolphin or even a bottlenose. The other issue is lack of corroboration. A dolphin should be active enough on the surface to be seen again and hopefully recorded. So far, no more images have turned up. I say that with the proviso that I have no idea how long a saltwater beast like the dolphin can survive in the colder, freshwater environment of Loch Ness. For all I know, it could be dead by now and at the bottom of the loch. The dolphins proposed in 1979 by Robert Rines of the Academy of Applied Science (shown below) to hunt Nessie were trained by being acclimatised to the loch's colder waters and would only have been released for a few hours a day. Today's dolphin (if indeed that is what it is) has no such advantage. Steve Feltham told me that there were two reports by locals who witnessed something that could have been the same object. However, what was really desired was more footage of the animal photographed by other tourists. These may exist and it requires the owners to take a closer look at their footage. The best hope here may be someone getting in touch with the Daily Mail. 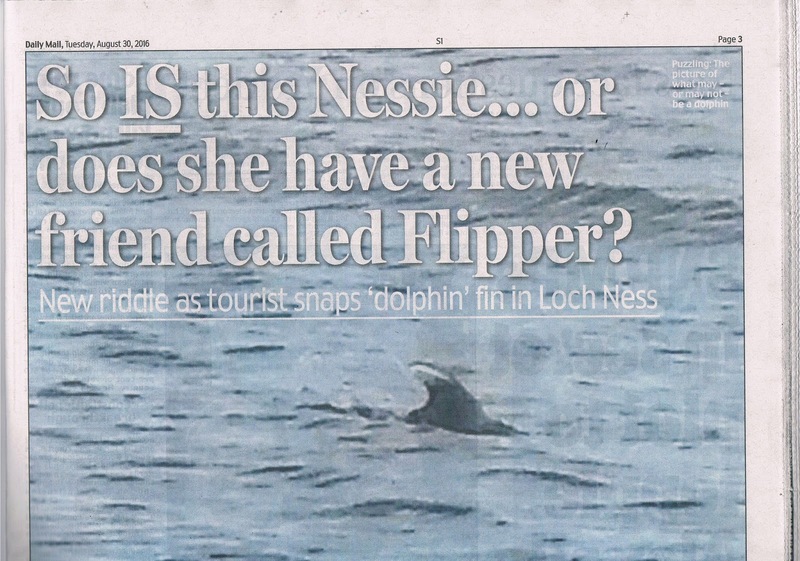 But, is it really that difficult to spot a dolphin in Loch Ness? Without another case to compare with, we don't know. The best comparison would be seals which occasionally get into the loch. Studies of a seal which entered the loch in 1983 concluded it would be very difficult to spot it unless you spent many hours close to the water. Even then, the seal under study confined itself mainly to the quieter south side of the loch away from tourist boats. Something was swimming about in Loch Ness in late August. The photograph suggests a dolphin, but even that particular identification has been questioned by a local wildlife expert. This photo has been treated a bit like photos of Nessie and challenged because dolphins simply cannot get into Loch Ness under their own steam. Hence the reason why Steve Feltham suggested a rogue fishing boat dumped the animal there. It's a theory that resolves a conundrum, but no one has come forward with a confession (if they were that bold). One could semi-seriously suggest the cetacean got in via the notorious underwater channel attributed to the Loch Ness Monster, but that is explaining one mystery with another. Could it be our monster after all? As explained in my previous article on the Adams/Lee picture, reports of fin-like objects tend to be of the triangular variety and are assumed to be humps. That interpretation could be wrong, but no one I am aware of has reported a thin fin. Ultimately, this episode has proved to be no more than another opportunity for debate and a chance to exercise some photo analysis tools. Unless more information is forthcoming, we know a dolphin from beyond the Moray Firth somehow got into Loch Ness and will likely makes its grave there.